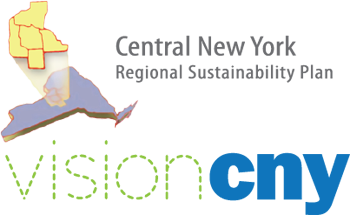 The Regional Sustainability Plan for Central New York is currently under development. As products are completed, they will be posted to this page and accessible to the public. Please check back to see what is new. You may also sign up to receive our e-news updates by clicking here. As part of the CNY The Central New York Regional Planning and Development Board (CNY RPDB) conducted a survey of municipalities in the CNY Region to gauge what matter of projects had occurred or were underway at the local municipal level. 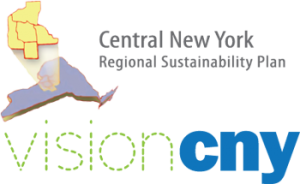 The Central New York Regional Planning and Development Board (CNY RPDB) released the first DRAFT of the Vision CNY Regional Sustainability Plan on Tuesday February 14th 2013. The DRAFT plan document will be reviewed at the February 20th meeting of the CNY RPDB. Comments can be submitted by utilizing the contact us page, or forwarded by mail to the offices of the CNY RPDB – 126 N. Salina Street 100 Clinton Square Suite 200, Syracuse, NY 13202. The following document includes the DRAFT Goals, Strategies, and Project Recommendations that were reviewed and discussed at the CNY RPDB Annual Meeting on December 12th. Comments can be submitted by utilizing the contact us page, or by visiting the wikiplanning.org on-line participation site.